While it sounds obvious, this can be a difficult evaluation for many business owners. 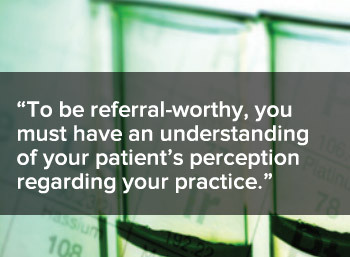 To be referral-worthy, you must have an understanding of your patient’s perception regarding your practice. Start by considering each aspect of their experience - from scheduling their appointment to the waiting room, healthcare services, outcomes and billing. Do your patients receive an exceptional level of service through every touch point of your practice? If not, what can you change? If you don’t know – a key portion of your referral strategy should be to implement opportunities to collect information surrounding patient satisfaction. Often there is a sense of dread when asking for referrals – specifically in how and when to pop the question. Asking doesn’t need to be a sales pitch – your pitch is made in the service you provide and the results your patients achieve. As a less invasive approach, let your patients know that you are now accepting new patients; whether it’s a flyer within the waiting room, a mention within your practices email newsletter, or a verbal update from the receptionist at check-out. You may find that some of your best referrals come through your professional contacts, or other healthcare providers. Networking is still one of the best approaches to building relationships within the community. First impressions go a long way. Once you bring in a new patient be sure you deliver on your promise of being an exceptional practice. Provide new patients with a welcome kit to help answer those new patient questions, tailor their appointment reminder phone call to include a warm welcome, and let them know from the start that they’ve made the right choice. Along with providing a warm welcome, be sure to thank the patient or clinic who has referred the new business to you. A simple thank you card or small gift reinforces your practices 1-1 focus on relationships.